254,863 Flickr hits – Thank you! CIAT’s photo gallery on the picture sharing website Flickr has now received over a quarter-of-a-million hits. The landmark figure was reached last week, while I was deep in the Amazon Rainforest – one of the few places left in the world without wireless internet access, hence this slightly delayed post. At the time of writing, the CIAT gallery – which showcases the institution’s research into sustainable, eco-efficient agriculture across the tropics – has now received 254,863 hits since it was established in May 2009. It contains over 2,000 searchable shots from Latin America, East and West Africa and Southeast Asia, and has recently been expanded to include multimedia products, like the CIAT Photo Challenge (also on CIAT’s YouTube channel). Users of CIAT’s Flickr page include the BBC, New York Times, Scientific American, Associated Press, National Geographic, The Guardian, United Nations Development Program, The European Commission and many more. 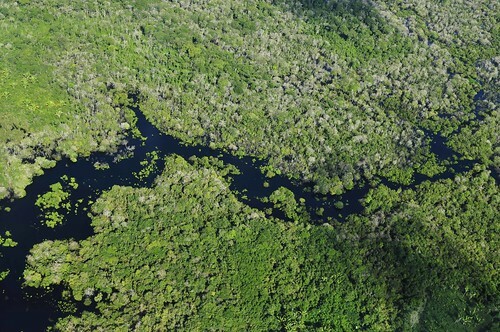 To mark the occasion, you can see a new set of aerial shots taken last week, during an occasionally-wobbly flight from Manaus to Novo Aripuana, in the Brazilian Amazon. With five of us squeezed into a four-seater plane, these shots would not have been possible without the saintly patience of the passengers on either side of me, who tolerated my wayward elbows and intrusive hardware, and also the permission of the pilot for the use of electronic devices during take-off, landing and the whole time in between. More pictures from the Amazon will follow this week. Nearly all the pictures on CIAT’s Flickr photo gallery carry a Creative Commons Attribution-Share Alike licence. This means you can download the shots directly from the site for your own, non-commercial use, provided you remember to credit – and please let us know when and where you use them. Many thanks to all of you who have used and continue to use the site – and stay tuned for more. For further enquiries please contact me through the blog or Flickr page. To learn more about the work of CIAT to find sustainable solutions to hunger and poverty in the tropics, be sure to check the CIAT website.